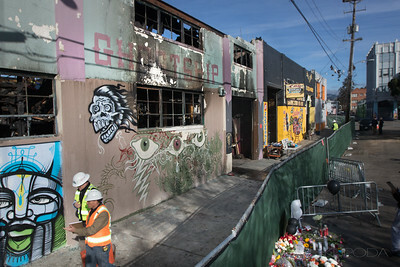 Ghost Ship Warehouse Dec. 12, 2016. 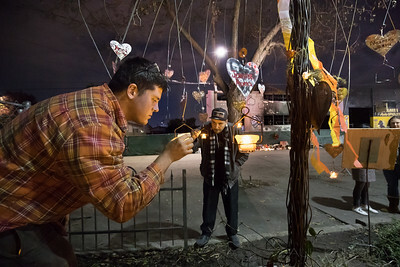 David Date and Rudy Menoz, metal workers, place candle lights on their metal sculpture across the street from the Oakland Warehouse, named Ghost Ship, where 36 people died. The piece consist of 36 stainless steel heart with hand written names of each of the victims on 36 branches of a Willow tree made from metal. With the concept by Willow Mahoney they worked on it since last Thursday and spent 60 man hours since that time to complete it, installing it a few days earlier. The company they work for, Steel Worx in Santa Clara donated about $3000 in materials plus labor. Ghost Ship Warehouse Dec. 12, 2016. 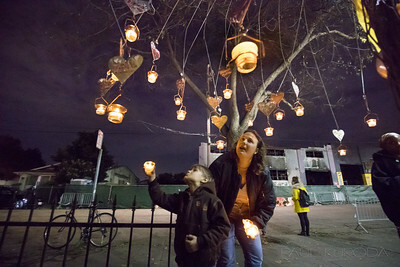 Willow Mahoney and her son, Tao, 6, places electric candle lights on a metal sculpture she designed and installed across the street from the Oakland Warehouse, named Ghost Ship, where 36 people died. She and a team of metal workers worked on it since last Thursday and spent 60 man hours since that time to complete it, installing it a few days earlier. The piece consist of 36 stainless steel heart with hand written names of each of the victims on 36 branches of a Willow tree made from metal. The company they work for, Steel Worx in Santa Clara donated about $3000 in materials plus labor. Ghost Ship Warehouse Dec. 12, 2016. 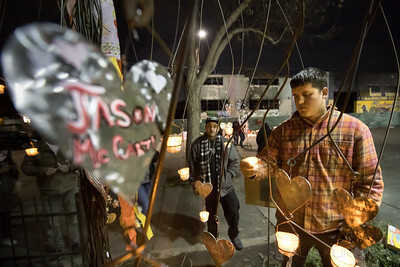 Metal workers David Date (r) and Rudy Menoz add electric candle lights on a metal sculpture across the street from the Oakland Warehouse, named Ghost Ship, where 36 people died. With the concept by Willow Mahoney they worked on it since last Thursday and spent 60 man hours since that time to complete it, installing it a few days earlier. The piece consist of 36 stainless steel heart with hand written names of each of the victims on 36 branches of a Willow tree made from metal. The company they work for, Steel Worx in Santa Clara donated about $3000 in materials plus labor. Ghost Ship Warehouse Dec. 12, 2016. 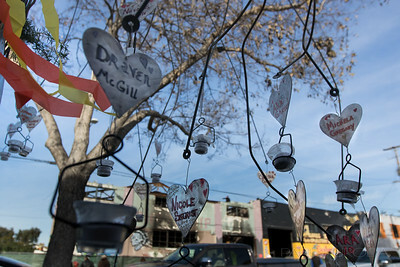 Tim Rothwell, visiting from Los Angeles pays his respect at the memorial display at the door of the Oakland Warehouse, named Ghost Ship, where 36 people died. Rothwell has written a popular college food app call Hooked. Ghost Ship Warehouse Dec. 12, 2016. 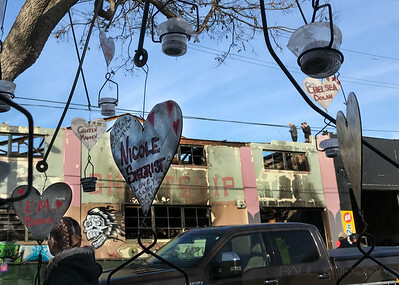 A metal Willow tree holding hearts with names and notes (including the parents of Nicole Siegrist) across the street from the Oakland Warehouse, named Ghost Ship, where 36 people died. The sculpture was the concept of Willow Mahoney and made by Steel Work in Santa Clara. Ghost Ship Warehouse Dec. 12, 2016. 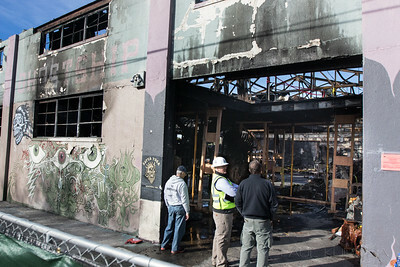 Inspectors and officials at the Oakland Warehouse, named Ghost Ship, where 36 people died. 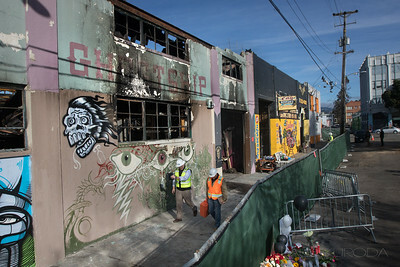 Ghost Ship Warehouse Dec. 12, 2016. 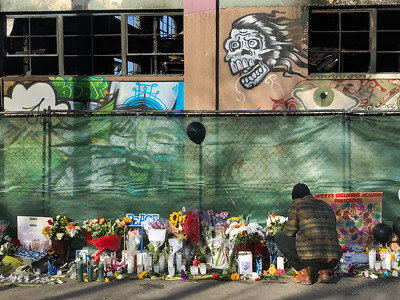 Inspectors this morning at the Oakland Warehouse, named Ghost Ship, where 36 people died.